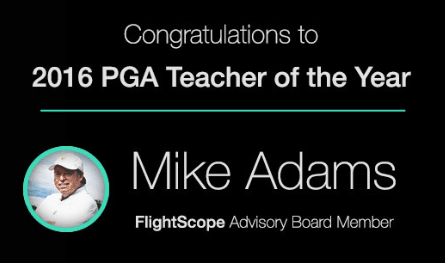 Congratulations to FlightScope Advisory Board Member Mike Adams on being honored with the 2016 PGA Teacher of the Year title! Mike was recognized for his “outstanding services as a golf teacher, innovator and coach.” He was recently inducted into the World Golf Hall of fame and is a nationally renowned golf instructor who has been listed on every GOLF Magazine Top 100 Instructor and Golf Digest Top 50 Teacher list. We're tremendously lucky to have him as part of the FlightScope family. Well done, Mike!